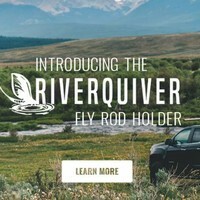 Every so often a rod company comes out with a new fly rod that seems to push the envelope in technology, design, and innovation. 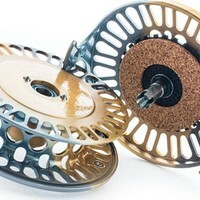 I’m not the kind of angler that is overly impressed by fancy sounding “breakthroughs” in fly rod technologies. I want to know what it’s going to do for me on the water. If you’re the type who likes that sort of thing, the more power to you and the Asquith will certainly meet that criteria. It’s developed and hand-finished in Woodland, WA and the blanks are rolled in Kumamoto, Japan in Shimano’s Spiral X facility. For whatever reason G-Loomis isn’t always the first company that pops in the mind when you think of fly rod brands. 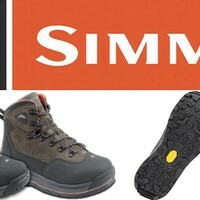 It may be because they aren’t exclusively a fly fishing specific company, or it may be because they don’t market to fly fishermen as well as others. Your guess is as good as mine. One thing I know is that it’s not because they don’t make a killer fly rod. The IMX, GLX, NRX are some of my all-time favorites. Ask anyone who has owned any of the aforementioned and you will hear nothing but rave reviews. The NRX LP is a dream dry fly rod that every owner rants about. It’s time to add the Asquith to that list. One complaint that I’ve gotten over the years about Loomis is how they look compared to other fly rods. In the past many of their rods seemed to resemble more conventional gear. They definitely had that “Shimano” look. The Asquith is all fly. 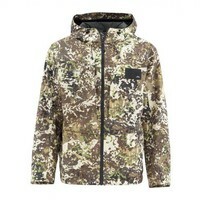 It has a much more refined look that fits what most people in the fly fishing world are looking for. The way the blank is made gives it a very unique almost marbling look that is like nothing else on the market. When the sunlight hits the blank you can see the dark green coloring that is also a nice touch. Guide wraps are clean and match the blank. Loomis has gone away with the blocky lettering and fish decal and instead marks the Asquith with very nice looking cursive font. It’s still not the hand inscribed lettering you see with other high end rod companies but it’s certainly a step up for Loomis. 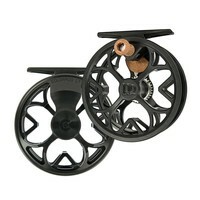 The reel seat goes above and beyond, incorporating narrow ring bamboo giving it an incredibly one of a kind look. Loomis also decided to go away from the ugly Recoil guides/Strippers and replaced them with titanium snake guides and high quality lightweight strippers. All of this combined makes the Asquith one of the best looking fly rods available. Apart from that, these components are top grade and that translates into a very lightweight high performance rod. After reading about what Loomis went through to create this rod I was ready to see what it could do. Lately, most of the new rods I’ve gotten ahold of all feel very similar. Often very good, but similar. It’s hard to differentiate and say a certain rod is better or worse in this scenario or that. 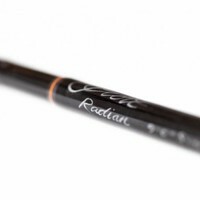 I can say without a doubt the Asquith is not just like all the other high end rods. G-Loomis builds this blank on a one of a kind machine that only exists in Japan. Which is a major reason the cost hits that four digit mark. I’ve been told that Loomis is trying to work something out to get one of these machines in the states. One thing is for sure, no one else has the capability to make a blank like the Asquith. It’s built on the Spiral X platform that adds incredible stability to the rod, giving it unmatched strength and accuracy. 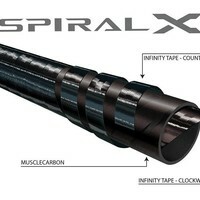 Without getting carried away, Shimano utilizes an inner layer of Infinity carbon tape with their “MuscleCarbon’ core and finishing it off with Infinity Tape rolled in the opposite direction of the inner layer. For me, I really want to know how all that technology translates to fishing applications and my overall casting and fish catching experience. Rubber hitting the road if you will. This design allows for added strength while keeping the overall swing weight very low. The Asquith is probably the lightest fly rod I’ve ever had in my hand and the actual swing weight is amazingly light as well. 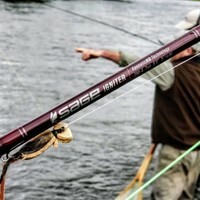 When pushing a fly rod to the limit the breaking point is often due to ovalization of the blank and this technology reduces the chances of a catastrophic break. Another advantage is its level of accuracy. The way that the graphite is rolled makes the blank stable and inline when flexing from all different angles. A cross shoulder cast is just as accurate as a standard over the shoulder cast. I’m fortunate enough to own the 9ft 6wt Asquith and I’ve been blown away at how well it performs in the accuracy department. Pinpoint is not an exaggerated cliché. Another thing that I loved about this rod is how the action is a perfect balance between power and feel. It’s a fast line speed rod that has accessible power you don’t need to dig deep for. It’s right there at your fingertips. You can load the rod in tight and with minimal back casts power it up for the hero shot. I’ve taken this rod out to Ennis Lake where we get prolific Callibaetis hatches with large finicky trout working the surface. If you’re quiet enough you can sometimes get within 30ft of the risers without putting them down and this rod was plenty delicate to lay light tippet and small dries down without turning the fish off. More often than not the fish pick up on you and go down before you can get in close like that and you need to push that 60ft mark. Again the 6wt Asquith had me covered with plenty of power. I haven’t got to test out all the line weights but I love my 6wt and would be shocked if the others didn’t meet your need. The Asquith is offered in a full lineup of rods. The 4wt-6wt will have that nice fast action feel without overdoing it and the larger weight rods, 7wt-12wt, will differ slightly with more of a power profile that you see in saltwater rods. Loomis also offers this rod in a two-handed Spey line that is known for power and versatility. With the Asquith I would recommend going up a half line weight. 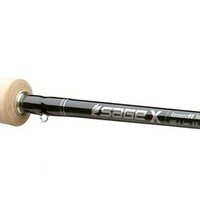 My favorite is the Sci Anglers Amplitude MPX. Depending on application, you could also fish the standard Sci Anglers Amplitude Trout if you need delicate presentation. 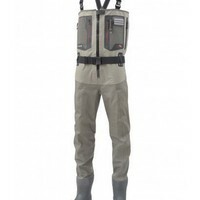 It’s a versatile enough rod that over-lining isn’t absolutely necessary but I do recommend it. With the Asquith being so light I would stick with a pretty light reel to keep the setup balanced. I don’t think it’s terrible to have a little more weight in the reel to give it a sort of pendulum feel but don’t overdo it. The Nautilus X is what I fish on my Asquith and love how feels. The Bauer SST is also a great fit.